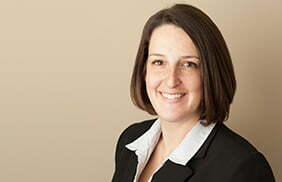 Elissa K. Halloran, an associate with the firm since 2011, received her undergraduate degree from Towson University in 2001 and her law degree from The University of Baltimore in 2005. Prior to working with the firm, Ms. Halloran worked in Carroll County representing clients in family law matters and criminal matters, and in Anne Arundel County representing victims of domestic violence. Ms. Halloran’s practice areas include family law matters such as divorce, custody, child support, alimony, property disposition, and domestic violence, as well criminal defense. Ms. Halloran is a member of the Harford County Bar Association. Ms. Halloran is also an adjunct faculty member at Carroll County Community College, where she teaches The Legal Environment of Business. In her free time, she enjoys spending time with her husband and children.